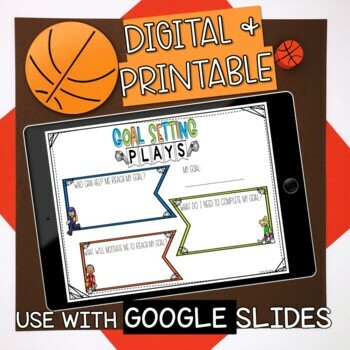 Teach students to set goals and create a detailed plan with this sports themed success skills lesson. They will learn about behaviors that prevent goal completion such as procrastination, making excuses, not being realistic, doubting yourself, and discounting the goal. This activity takes about 30 minutes to complete with a small or large group. 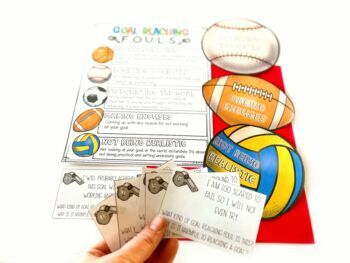 The goal is for students to recognize negative goal behavior (sorting activity) and practice setting a realistic goal and creating a plan to achieve it (worksheets). 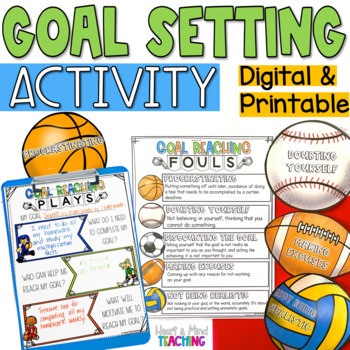 ►Activity description including instructions/walk-through of activity, objectives, materials, guiding questions, ASCA standards, and SEL competencies. 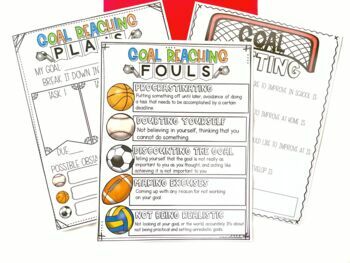 ►5 goal setting pages, each with a different sports theme. ►3 goal reaching pages, focusing on ONE goal. ►3 pages of sports balls, each listing one goal reaching foul. ►Black and white versions included! Click here to follow my TPT store➜➜➜➜➜➜FOLLOW ME!